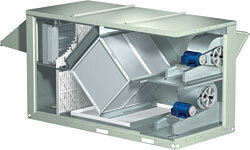 Heat recovery unit recovers up to 60 percent of the sensible energy in the exhaust airstream and returns it to the supply air. The Model PVe cross-flow plate exchanger unit uses an aluminum core (plate) and has very low leakage and no moving parts. Features include stainless steel drain pans and belt drive blowers with adjustable pulleys. Performance ranges from 1,000 to 6,000 cfm.